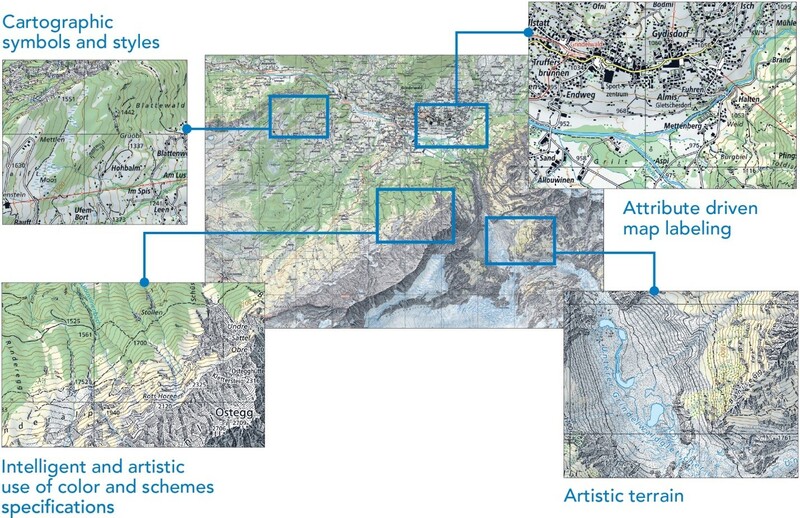 The ArcGIS platform provides capabilities that enable everyone to make truly excellent maps, including support for highly sophisticated mapping workflows employed by professional cartographers. Desktop includes tools for rich data compilation, for importing data from a multitude of publication formats, and for integrating this data with your own data to create consistent, accurate, and beautiful cartographic products for both printed maps and online maps. Swisstopo is the official name for the Swiss Federal Office of Topography, Switzerland’s national mapping agency. With all the mountains in Switzerland, it should be no surprise that they developed many of the classic cartographic techniques, like the Swiss Hillshade. Two key applications available in ArcGIS Desktop provide advanced mapping capabilities. ArcMap has been the workhorse application for serious cartographic production to create print maps and online maps with advanced labeling and impressive cartographic symbols and representations. It is used daily by hundreds of thousands of GIS users worldwide. The new arrival is the modern ArcGIS Pro application, which builds on the tradition for great mapping and adds things like advanced 3D scenes. What makes a good map? How can you engage people with a map? How do you make a map that offers unexpected insights and captivating appeal? We have been working on something at Esri that we hope will answer these questions: Maps We Love. Maps We Love is an ongoing project where you will see the best of what’s possible with ArcGIS. This is where you come for the inspiration, ideas, and information you need to turn your data into brilliant maps. We give you a behind-the-scenes look at important steps, plus resources (lots of links) so you can dig deeper into these topics. Maps We Love is designed to demystify mapping, to give you the confidence and assurance that you can make maps. Get inspired and learn current mapping techniques using curated selections of exemplary cartography at the Maps We Love website.